Summer is winding down, but excitement is in the air as students gear up for the new school year. For some, this semester will mark their first steps into the storied halls of higher learning. Others will continue the journey down their own paths. All, however, will be greeted by students from a diverse range of backgrounds with varied interests and perspectives, working towards the expansion of their intellectual horizons. FIRE’s hope is that all members of the campus community will be free to live, learn, and engage in a climate that promotes free thought and open discourse. To these ends, the FIRE Student Network is proud to launch our fall 2018 campus activism toolkit: Commit to Expression! 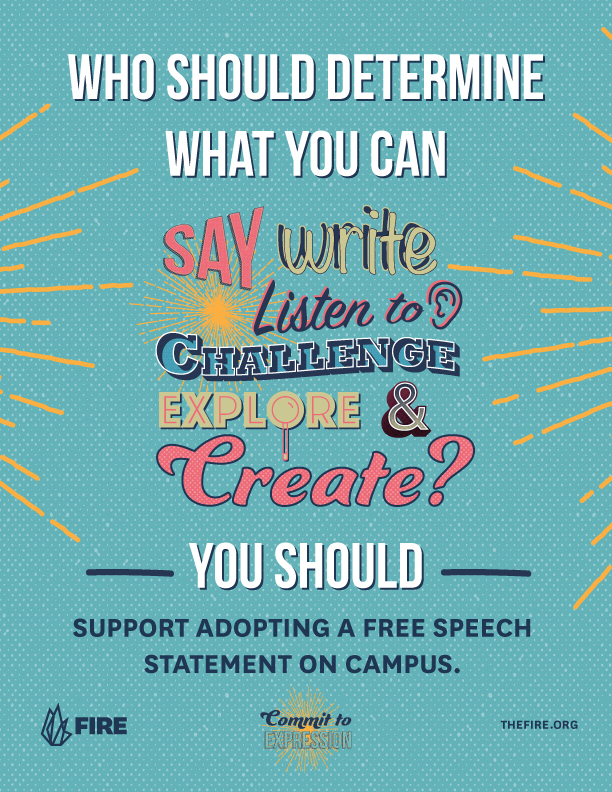 The Commit to Expression toolkit provides students with everything they need to work towards the adoption of a free speech policy statement at their school and to educate the campus community about the principles of free speech. Among many other resources, the toolkit includes sample letters to administrators, sample student government resolutions, downloadable graphics to enhance Commit to Expression initiatives, and step-by-step guidance on effective activism on campus. 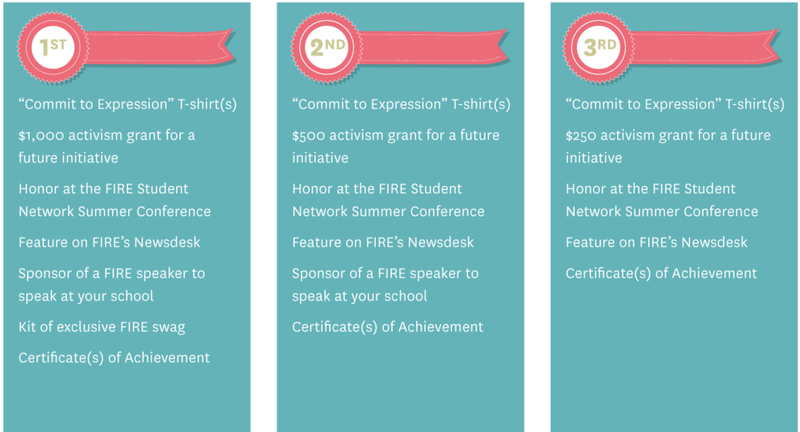 Students in need of funds to help them get started should email students@thefire.org with a note detailing how much funding they need and an explanation of how they plan to use the funds. As a way to honor students who execute the best campaigns on campus, we are offering some incredible prizes. FIRE will announce the winners on Dec. 21, 2018. Since 2015, FIRE has urged colleges and universities to proactively adopt a statement on freedom of expression modeled after the “Report of the Committee on Freedom of Expression” at the University of Chicago (the “Chicago Statement”). To date, 44 university and faculty bodies have succeeded, and many more have joined the campaign. The statement’s inherent value is found in its powerful endorsement of robust discussion and debate, beyond mere compliance with the First Amendment. 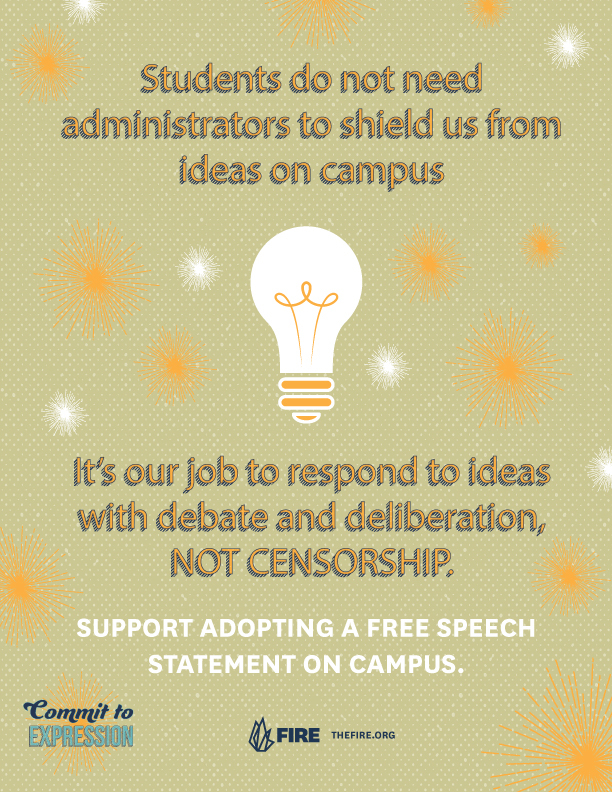 The statement not only echoes core First Amendment principles, but broadly expands upon them, envisioning a campus climate that values free expression as the lifeblood of the university. 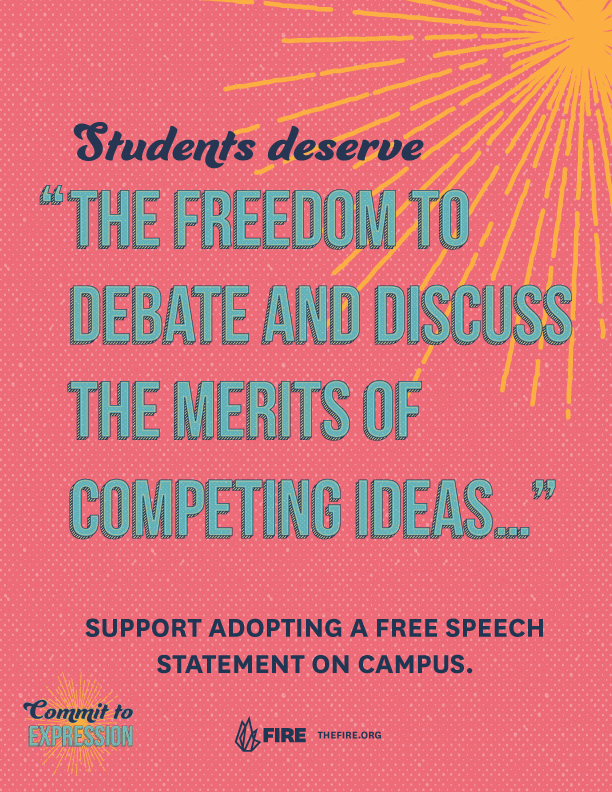 In the coming months, students from across the country and ideological spectrum will mobilize to fight for the adoption of a free speech statement at their schools. These students will seek to create a future defined by a shared commitment to free expression and academic freedom for everyone, no matter the viewpoint. Sign up today to take part in the Commit to Expression toolkit, and help ensure that a culture of free speech and robust debate is cultivated at your school for generations to come.